VLANs to keep the traffic of different customers segregated. to be configured or else they will NOT get propagated accross the tunnel. and then reload the switch to take effect. 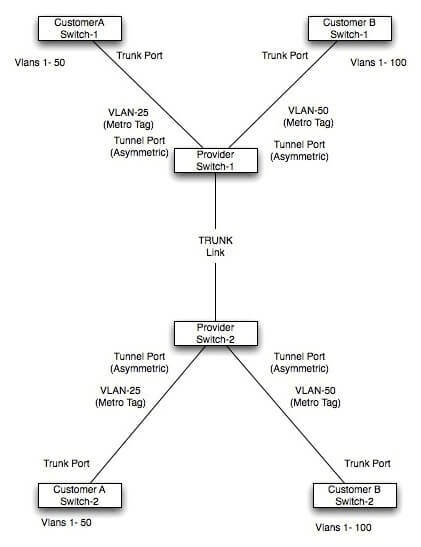 In this diagram, notice Customer A is sending VLANs 1 – 50 over the metro ethernet link to the Provider network,where it crosses the Provider network and is able to communicate on the other end with its remote switch. Similarly Customer-B is sending VLANs 1 -100 over its metro ethernet links. Both the customer traffic kept separate with the use of the Q-in-Q. The Provider Switch Ports connecting to the customer switch are configured as not trunk and the customer switches are configured as trunk ports, this is reason why the provider end of the switch is called as an asymmetric port, the provider port is configured as a tunnel port and not a trunk port. Also make note that the Provider Switch Port connecting to customer-A switch Port is configured in VLAN 25, this is also called as the Metro Ethernet Tag. Similarly the Metro Ethernet Tag for Customer-B is VLAN 50. Customers build standard 802.1 Q trunk ports and the provider builds a tunnel port with the VLAN tag, So the customer traffic is identified with this additional Q tag. Notice that the Metro VLAN tag is same for each of the same customer’s location and it is different for each customer identifying each customer’s location. Provider Edge switches treat everything that comes in the tunnel port as untagged even if customer is sending tagged traffic and by default the Priority tag is set to 0. Notice when 802.1Q trunks in Provider network are used, the native VLAN of these trunks cannot be the same as the native VLAN on any tunnel port to avoid double tagging of customer traffic. Providers can use a native VLAN that is not being used by of the customers- beacuse this can cause issues later when some new customer or existing customer changes their VLAN which can match this Native VLAN, so the other two choices in Provider network will be to either use ISL trunks (possible only if Provider has all Cisco switches) or go ahead and tag the native vlan on all provider edge switches with command: “vlan dot1q tag native vlan”. 2. If SVI are used then only untagged frames (native vlan frames) sent by the customer will be routed. 4.Layer 3 quality of service (QoS) ACLs and other QoS features related to Layer 3 information are not supported on tunnel ports. MAC-based QoS is supported on tunnel ports. 5.Port Aggregation Protocol (PAgP), Link Aggregation Control Protocol (LACP), and UniDirectional Link Detection (UDLD) are supported on IEEE 802.1Q tunnel ports. Note: When using Q-in -Q increase the MTU on the frames, because of the addition of a new tag the ethernet frame size increases, so its recommended to increase the MTU of the ethernet frames by 1504 atleast “system-mtu 1504” and reload the switch to take effect the change. Q-in-Q Tunneling and L2TP Configuration. Below is the Diagram we will utilize to configure a very simple Q-in-Q sample network. Some of the things like pictures are copied from the internet due to non-availabilty of the appropriate tool , as i am sitting in my office right now,still i hope this will be informative.